You are in good hands with this old salty sea dog! Dr. Bruce Hebeler is a U.S. Coast Guard Master and is a Captain’s License Training Instructor for his USCG approved school, National Maritime Courses. 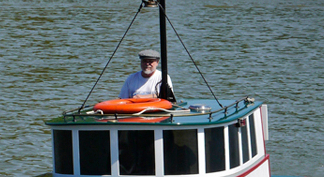 He has been boating since he was 9 years old starting on the east coast. He has been navigating the rivers of the Northwest for 30 years and not only knows the waterways, but the stories behind each turn of the river and the sights that go with them.